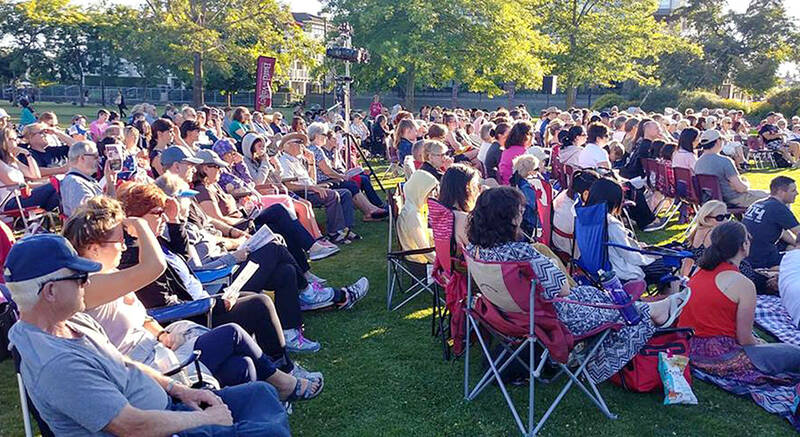 Some of the biggest crowds ever recorded in this year’s outdoor Shakespeare shows. Aug. 1, 2017 2:00 p.m.
Close to 400 people spent Friday night cuddled up on a blanket or lounging in a lawn chair as a romance of historic proportions unfolded before them in Douglas Park. Bard in the Valley attracted record crowds to this year’s production of Much Ado About Nothing, with the largest gathering of all – reportedly 375 people – at the second to last nighttime production on Friday, July 28. 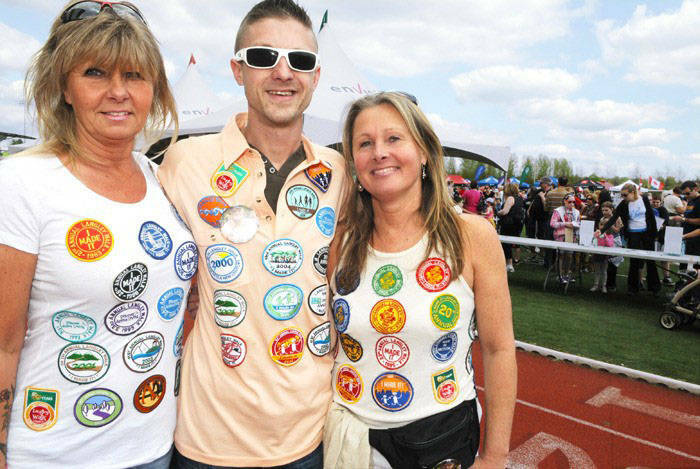 Friday’s number contributed to the highest weekend on record for BIV. There was a crowd of 1,200 at the last four performances Thursday through Sunday. “What a thrill for everyone involved in the production to see the wonderfully big audiences arriving,” said BIV’s president Diane Gendron. Overall, it was a record year for BIV, with 3,200 people who attended all 16 showings of this year’s Shakespearean production. 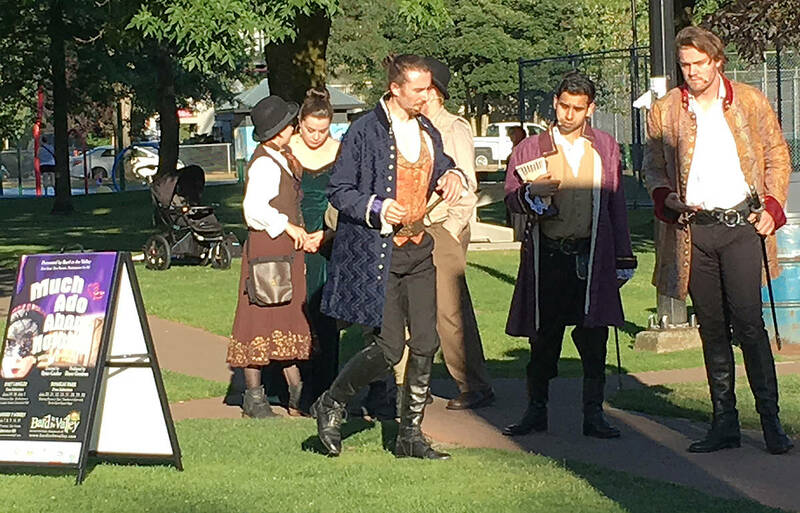 “At both Fort Langley, in front of the historic community hall, and in Douglas Park in front of the Spirit Square stage, the audiences were spread out all over the green space… many coming early and bringing picnics or just staking out their space,” said Gendron, who has been involved with BIV since the onset. She was equally elated to see so many children in the audience. They were “engaged from beginning to end and laughing at the funny bits,” Gendron said. Gendron noted that weather was good throughout the run – which opened June 29 and closed July 31. In all eight years of BIV, they’ve only had to cancel one show due to rain, she added. BIV may have just wrapped up its eighth season on Sunday, but they’re already gearing up for what’s coming next. First up will be a youth theatre workshop this fall. The workshops are on Tuesday afternoons from 3:30 to 6:30 p.m., beginning on Tuesday, Oct. 10 and ending Tuesday, Dec. 12 at HD Stafford Middle School. Sponsored by the City of Langley, the workshops are for children from 11 to 15 years of age. Admission is $60. To register email info@bardinthevalley.com. “This is an excellent opportunity for young thespians to experience and learn all aspects of live theatre – workshops on auditioning, rehearsals, script breakdown, set design and building, decorating, costuming, makeup, performing, technical, and team work will be offered,” Gendron elaborated. Also in the offing, the Township of Langley has invited Bard in the Valley back to put on another vintage Hitchcock radio play, complete with live sound effects. It will again be a dinner party and a suspense-filled play all rolled up into one evening, she said. It will be held at the Langley Event Centre on Tuesday, Oct. 24. More information will be coming out soon about tickets. As if there wasn’t enough on their plate this past weekend, as the BIV team wrapped up the final production of , the board of directors found time to meet and discuss plans for next season. Three potential directors pitched plays for the 2018 season, “all three were exciting proposals with good options for future years, as well,” Gendron said. But ultimately, the decision was made to go with Shakespeare’s Romeo and Juliet next summer. Langley’s Jacq Ainsworth will direct her own unique version of this play. As a world champion tae kwon do competitor, she will intertwine her backgrounds in martial arts and the stage, Gendron said.